Minnesota Timberwolves shooting guard Zach LaVine and Dallas Mavericks leading scorer Harrison Barnes are the latest players to have their moment card codes released. To claim them, just input the codes into your NBA 2K17 game. Many more are likely to come as the NBA season progresses. As is customary, both players tweeted the codes via their official Twitter accounts. For those who can’t see the embedded messages, the codes must be entered exactly as they’re listed. 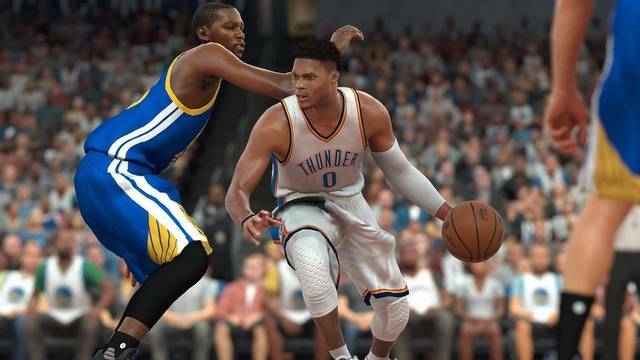 In order to redeem your Locker Codes you’ll need to have a full copy of NBA 2K17 installed on your console or PC. From the main menu, select Features/Options then select Locker Codes. Enter the Locker Code that you received, using the virtual keyboard. From there, enter the complete code with dashes included. If successful, a confirmation will appear on screen. Both the LaVine and Barnes cards have an overall rating of 82 with augmented shooting stats. Minnesota Timberwolves shooting guard LaVine recently took his team to victory against the Orlando Magic with a career-high 37 points. Barnes earned a win for his Dallas Mavericks, obliterating the Lakers by scoring 31 points against the Lakers this week. Both of those performances earned them the right to be featured in a new round of MyTeam Moments Cards. Just like all previous locker codes for NBA 2K17, these ones are limited free agents, whichmeans they can only be used for a select number of games. That being said, after this free card elapses, it’s also possible to earn both LaVine and Barnes in standard packs. Were you able to redeem your Zach LaVine and Harrison Barnes locker codes? Does your favorite player have a moment card already? Why not ask him for a locker code?